Summer fête funds will be used to buy a cabin for residents at Cavell House care home in Shoreham. The aim is to give the residents the opportunity to go outside and visit the garden all year round. The fête, held on Saturday, August 11, was the first at the Middle Road home in four years and was organised by the new home manager, Nikki Stevenson. 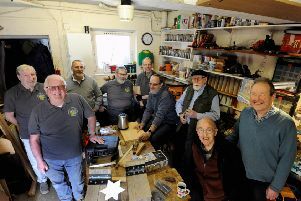 It raised more than £540, which will be used to buy a cabin for the large garden, which already has raised flower beds and a wheelchair-accessible patio area. Nikki, who has looked after the care home since October, said: “The summer fête was a huge success and the weeks of organising the event beforehand certainly paid off. “It was a great opportunity to show our local area what a fantastic place Cavell House is and for everyone to see how great our own little community is. There were children’s activities, face painting, a barbecue, tombola, raffle and karaoke, plus residents, families and guests were treated to music from a live ukulele band. There was also the opportunity to win a cake from Cakes & Jars By Shar. Annette Austin, a resident at Cavell House, said: “I had a lovely time at the summer fête and particularly enjoyed the music of the ukulele band. “I think that the cabin will be a welcome addition to the garden, as we will still be able to enjoy the outdoors even when it’s a little chilly or raining. Cavell House is part of Larchwood Care and is managed by Healthcare Management Solutions. The service provides residential and nursing care for up to 45 older people.